Here is a title that I've been waiting for with a mixture of curiosity and anticipation. When I visited the Airconnection booth at the Chicago Hobby Show a few years ago, the owner was telling me about this definitive work that they were publishing on the Soviet-designed T-34 tank. He had some sample pages from the draft and I was sold on the spot. It obviously took a little longer to get published than planned, but clearly they wanted to get it right. They did! 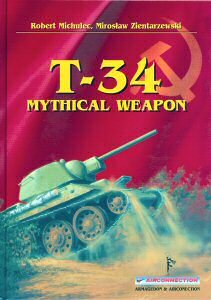 One thing that piqued my curiosity was the title - T-34 Mythical Weapon. As many tankers around the world will tell you, there is nothing mythical about the T-34, it was one of the key Soviet weapons that led to the conquest of Nazi Germany and would later serve as one of the major milestones in the development of future Soviet (and Russian) main battle tanks. After reading the introduction, the meaning of the title is perfectly clear, the authors had read historical works on either the T-34 itself or mentioning the T-34 in passing. 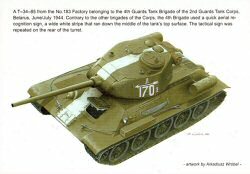 In each case, the authors considered the T-34 as almost invincible and one of the best designed tanks of the war. As Paul Harvey would say, the authors decided to research "the rest of the story" and investigate the negative aspects of the tank as well as its positive attributes. What they found out surprised them, hence the title "Mythical Weapon". The story picks up not in the Soviet Union, but in Germany. The Panzerwaffe was fielding a wide array of combat vehicles as part of the blitz across Europe, but when they started learning of the armor developments within the Soviet Union, work began in earnest to develop an effective counter. When the Germans aligned with Finland after the latter's brush with an attempted Soviet invasion, they learned of new heavy armor being employed by the Soviets. As more intelligence flowed in, they were hearing about the T-34 but mixing up some of the key capabilities with another Soviet design - the KV-1. Nevertheless, thanks to the threat of these new tanks, the Germans pressed ahead with the Panther and Tiger designs since it was only a matter of time before they would encounter these Soviet tanks on the battlefield. This title is quite amazing. Inside its 520 pages, the authors were forced to confine their studies on the wartime T-34 and its production variants. They didn't have the page space to cover the early prototypes nor much on the post-war developments. There is lots of good information on the reliability (or lack thereof) and limitations of the wartime variants. This is all reinforced with the finest collection of period black & white photos I've seen on the subject. The book is 12 x 8.5 x 1.25 inches and very nicely published and bound. The pages are high quality glossy paper that make the images even clearer. If weight is a factor, the book is also an impressive 5.5 pounds (2.5 kg)! The first 353 pages provide background and operational history of the tank. The next 74 pages provide photo details of unique differences in the various production versions of the tank. The authors have even compiled a list of T-34 serial numbers for wartime tanks as well as some post-war examples that served with the Polish army. There are 58 pages of 1/35 scale plans detailing the various production versions. This is followed by five pages of color computer cutaway models of the T-34/85 to illustrate some of its distinguishing features, as well as a page of color profiles illustrating the differences in the 23 different road wheel designs, six idler wheel designs, and nine drive sprocket designs used on the T-34. The title wraps up with a eleven pages of color photos taken inside the hull and turret of a T-34 as well as three pages of color profiles of selected examples. While the title is published in Poland, the text is written only in English, and it is not an awkward translation either. The American English writing and style is better than most titles that are written and published in North America. It is clear that they took their time to get this title right. I have been waiting to start my Trumpeter 1/16 T-34/85 project until I could find the right reference to work from. Since I also have interests in the history of Soviet armor and aircraft, I couldn't wait to get this title into my library. It was worth the wait and is definitely recommended for all armor enthusiasts who'd like to get their Soviet armor history straight. The publisher and North American distributor for this title is Airconnection and they offer the title from their website here. My sincere thanks to Airconnection for this review sample!